I'm in the depths of central London for this years Tinker.it Toy Hacking Workshop. 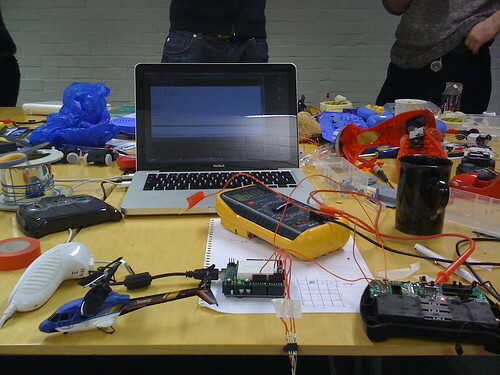 Toy Hacking Lab from Matt Biddulph. The pictures from last years workshop make this look like a fun event, and I'm looking forward to getting my soldering iron out and playing with toys. Both the grown-up and not-so-grown-up kinds. ...and you only had to look at evil Harmony Bear and Bubbles the Dog to know that our twisted minds were working at a feverish pace. My original plan was to hook the controller unit into an Arduino and try and control the copter from the command line. But Chris Loxton, the man behind evil Harmony Bear, had brought a Wii Nunchuk controller with him, so in the end I had a better plan. I hooked the Nunchuk up to the Arduino, making use of Tod Kurt's nunchuck_funcs.h library code, and then the Arduino in turn to the helicopters controller unit. After hacking some code out the helicopter was, at least in theory, going to be controllable using the Nunchuk's 3-axis accelerometer. The controller for the helicopter was fairly interesting, with the power and direction controls turning out to be digital rather than analog. Presumably to save money the rotor power control was digitally encoded into four bits using multiple contacts on the control lever, removing the need to provide any analog-to-digital circuitry, and as it happens simplifying the hack enormously. If I get another free weekend, I think I can move this hack forward quite a long way. Removing the excess foam from the helicopter itself will probably save enough weight to allow me to attach an accelerometer and an XBee module directly onto the helicopter. The data from the accelerometer can then be transmitted via the XBee to an XBee enabled Arduino which is also hooked to the hacked radio controller so that it can send commands back to the micro-helicopter, closing the control loop. Effectively I should be able to build a self-stabilising helicopter. Unless I'm explicitly sending a command to move the micro-copter, it should just hove in place, correcting any random movements cause by trim or other nagging problems like drafts and air-conditioning. You must be good at what you do. I hope you finish that toy and I think it'll be great. It'll also be nice if you update us.